How do you find the deals, buy the right product and avoid impulse shopping in the drugstore beauty aisles? "Going to a drugstore beauty aisle is like a kid in the candy store. Your mom won't let you get one of everything," says make-up artist Heather Hughes. When shopping for make-up, start closest to the door because that's where the big brands (and hopefully, big sales) are going to be. Then work your way toward the back. If you have a favorite department store lipstick color, bring it to the drugstore to find a similar color match. Heather says lipstick is lipstick, most of the time, so why pay more? 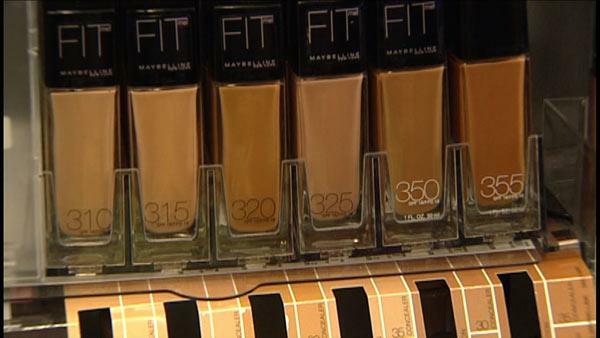 Finding the right foundation color at the drugstore can be scary. First, hit the company's website for a "color matching" survey. If you're already in the store, look for the company that has the widest variety of colors to choose from, purchase two or three shades and return the ones that don't work (check your store's return policy first). If the foundation you pick has a number instead of a name, match the numbers to find the corresponding concealer and powder. For example if your foundation is 225, your powder will probably be 225 and your concealer will probably also end in 5. Take advantage of sales! Mascara is often BOGO (buy one, get one) and you should be throwing old tubes away every three months anyway. In the skincare aisle, you'll usually find the big brands at the end caps to lure you in to the aisle. Once there, consider store brands. They often have the very same ingredients. Beware of "new" or "best product" on the labeling. It's there (and usually at eye level) to attract your attention. Look for skincare sets (if they're actually a bargain) and you think you'll use all of the products inside. Beware of the grab-and-go, impulse items! If you grab one every time you shop it'll add up fast.